What happens? Nature fights back! We’ve done our best to trash the planet. We’ve plundered the earth of precious stones, covered it in concrete to sell people things they don’t need, contaminated it with deadly radiation, declared a piece of it a DMZ to keep apart the heavily armed guards of two nations that hate each other, covered it in land mines, built factories on it for poison gas and chemical weapons so we can better kill each other, and even managed to dry out the 4th largest lake in the world by exploiting its water for our own questionable ends. For me, two telling themes emerge from the wildlife stories below: the ruthless devil-take-the-hindmost greed of the capitalist system we humans have created; and our unbridled propensity for violence and war. Yet even out of the trail of destruction we leave behind, Nature – which is so much bigger than the human race – takes over, nurturing life. Given less than half a chance, just look what Nature does. Abandoned in 1954, Kolmanskop, Namibia was once a flourishing diamond mining town until the mines were eventually exhausted of their riches. The human inhabitants of the town moved on and left what had been their homes, schools and shops to be taken back by the desert and the rare Namib Horse. Their origin is unknown as these horses are not indigenous to the region but by limiting human intervention, only offering water support during extreme drought, these horses have been able to adapt incredibly well to the unforgiving terrain and grow in numbers over the years in the ruins of this forgotten town. Arson and safety issues plagued the New World Shopping Mall in Bangkok, Thailand until it was shuttered in 1997. The roofless structure sat empty, collecting rainwater in it’s basement until a 1600 square foot pond formed. Mosquitos began to take up residence, annoying locals around the forgotten structure so much that they introduced some koi and catfish into the pond to combat the problem. Left to breed uninhibited, the fish flourished in their new environment and turned the mall into their own private aquarium. The future of the fish is unclear as there are questions about the stability of the building, but for now locals visit the fish to throw them food. While walking around the woods surrounding his summer home in Salo, Finland, photographer Kai Fagerström came upon a derelict house. Not one to miss a chance to snap some unique shots, Fagerström ventured inside to see that the house may have been derelict but it was far from empty. The house was teeming with animal tenants like badgers, mice, foxes and birds to name just a few. In fact, 12 different species of animals were all living together in harmony under the same roof, becoming the subjects to his photo book The House in the Woods. In 1986 the residents of Pripyat, Ukraine were forced to abandon their homes as the nearby Chernobyl Power Complex experienced what is considered the worst nuclear meltdown in history. The area has been deemed uninhabitable for the next 20,000 years as radiation levels in the area continue to measure off of the charts, but that hasn’t stopped a large variety of wildlife and insect species from moving in. In fact, the native animal populations like wild boar, dogs and horses have thrived in the exclusion zone, making the area around Chernobyl a natural refuge in the absence of human occupants. Scientists have only recently been allowed access to study the area and its inhabitants, with the results providing an unsure glimpse at how the thriving populations will be effected by the radiation for generations to come. Only time will tell, but for now the city of Pripyat is populated with a diverse selection of life. In place since the Korean War Armistice in 1953, a 250 km long and 4 km wide swath of land known as the Demilitarized Zone separates North and South Korea from coast to coast. With people only being allowed to enter through special permit over the last 60 years, the area has become the perfect place for a large variety of indigenous and critically endangered wildlife to live undisturbed. Animals like the endangered white necked crane, vulnerable Amur gorals, the asiatic black bear, Siberian musk dear and the nearly extinct Amur leopard are among the 2,716 different species thought to inhabit the area. After the dust settled in the Falkland Islands War in 1982, the waters surrounding the area became so overfished that local penguin populations began to decrease dramatically. Ironically, it was this very overfishing and the ravages of the war that preceded it that ended up creating a unique natural habitat for the penguins to start rebuilding their numbers and living freely. As a deterrent to the British, the Argentinian army laid 20,000 land mines along the coast and pasture lands surrounding the capital that remain to this day. Too light to set them off, the penguin population lives happily and totally undisturbed in this unlikely sanctuary. Since 2001 the Mass Transit Authority of New York has been participating in a program that retires old subway cars and dumps them along the eastern seaboard to create artificial reefs. Known as Redbird Reef, the cars are stripped of floating materials and then cleaned before they’re dropped into the ocean from barges. By 2010 the program had placed over 2500 cars into the water in the hopes of giving marine life in the area a home to breed and thrive, including black sea bass, flounder, turtles and barnacles. Don’t forget to take your carrots! The tiny island known as Okunoshima Island in Takehara, Japan is also colloquially known as Usagi Jima, or “Rabbit Island.” Abandoned after World War II, the island had been home to a poison gas facility. How the rabbits came to be on the island is a source of debate but with larger animals like cats and dogs being banned from its shores, the bunnies of Usagi Jima are free to roam wild and multiply while taking the occasional carrot from an adoring tourist. Formerly a Coast Guard light station until it was abandoned in 1948, Año Nuevo Island in California is teeming with wildlife. Now part of a nature preserve operated by the California State Parks, the island boasts one of the largest northern elephant seal mainland breeding colonies in the world. It also plays host to cormorants, terns, otters, California sea lions as well as the rare and endangered San Francisco Garter Snake. What was once the fourth largest lake in the world at 26,300 sq mi – that’s bigger than all the Great Lakes of North America with the exception of Lake Superior, the Aral Sea in Central Asia is now on the verge of being completely dry due to rivers and dams diverting its water elsewhere. The effects of this were devastating and the area is being monitored so environmental improvements can be made. 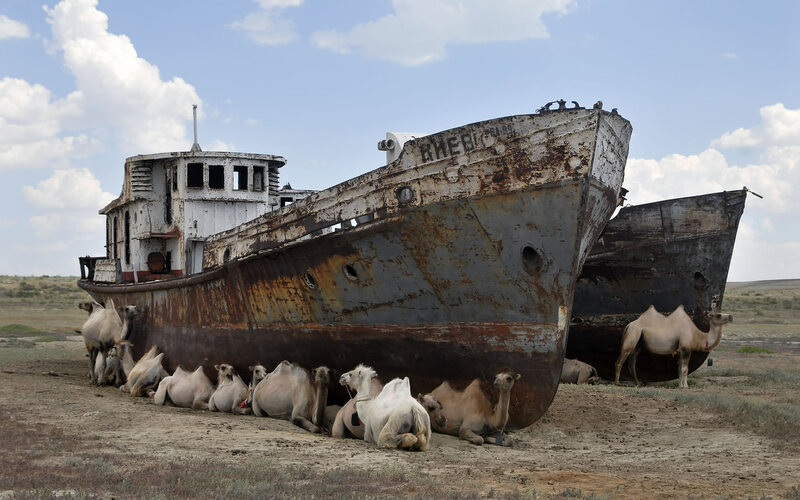 Leaving behind a sandy desert and stranded fishing boats, the dry lake bed now sees local camels roaming freely amongst wasted hulls to take a rest from the sun. Revitalization efforts are underway and showing real promise for the area and the wildlife that has moved in, including not only camels but asiatic foxes, wolves and boars. Once a chemical munitions plant, the Rocky Mountain Arsenal in Commerce City, Colorado last saw production in 1982. Clean up and decontamination of the site kept humans from entering the area, which left a perfect opening for animals to move in and create an involuntary refuge. In 1986, much to the surprise of the U.S. Wildlife and Fish Service, it was discovered that not only was there a communal roost of bald eagles taking up residence but also 330 additional species of wildlife had moved in. Today the site is a National Wildlife Refuge and boasts deer, bison, coyotes and owls. These good news wildlife stories leave a bitter aftertaste – in most cases (thankfully not all) the animals are making their lives in spite of the wreckage wrought by human hand. The DMZ seems an apt metaphor for the present state of the planet: hostile peoples pointing killing machines at each other, and in the little space left between, Nature. Nature generating and nurturing transformative life – in abundance. This is wonderful! It offers hope for all the other species and the earth. The “stewardship” of H. sapiens has been compared to a metastatic cancer, a plague, and a raging wildfire that destroys everything in its path. But is good to know that when we finally doom ourselves with our own reckless behavior other lives and the planet will flourish. Without our interference, maybe there will be an Eden on earth.